Family Dollar Stores said on Thursday that it was taking more steps to increase its profits, while reporting earnings for the fiscal third quarter had fallen by 33% due to higher costs offsetting a slight upswing in revenue. In April, the discount retailer said it would shutter nearly 370 of its stores and lower the prices on close to 1,000 items so it could remain competitive. Family dollar on Thursday said it was building on those cost saving efforts. Starting in the upcoming fiscal year, the company is planning to expand the amount of coolers it has to capture more sales in food and roll out wine and beer to attract more traffic into the its stores. 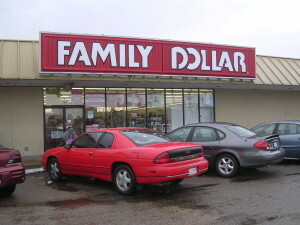 Dollar stores like Family Dollar have had to alter the type of merchandise they carry to keep customers they were able to gain during the recent recession. The retailer is attempting to improve its results while facing increased competition from other dollar store retailers and from retail behemoth Walmart, which has opened new smaller locations. The company shrank its guidance for earnings for the current year amidst the increased competition. The retailer has forecast earnings per share of $3.07 to $3.17 from its original of $3.05 to $3.25 per share. CEO and Chairman Howard Levine said that the company’s results reflect the challenges economically facing the company’s core customer and the intense competitive market we are in. Levine added that sales remained lower than company expectations. During the recent quarter that ended on May 31, sales that excluded any new or closed stores dropped by 1.8% which was in line with the expectations for a drop in the range of low single-digits. Family Dollar has also become the target of Carl Icahn the activist investor who encouraged the low-cost chain to put itself up for sale. Thus far, Family Dollar has rebuffed the advances made by Icahn and did not mention him in their report on Thursday. Profit overall for Family Dollar was $81.1 million equal to 71 cents per share, which was down from the same period a year ago of $121 million equal to $1.05 per share. Net sales were up to $2.65 billion an increase of 3.3%.